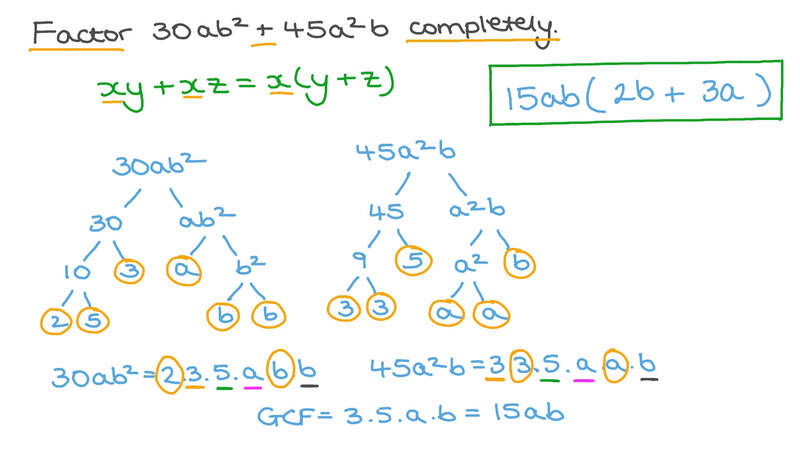 In this lesson, we will learn how to rewrite algebraic expressions using the distributive property. Using the distributive property, rewrite the expression ( − 2 𝑥 − 8 ) ( − 6 ) . Expand − 2 𝑥 ( 5 𝑥 − 5 𝑥 ) 3 2 . Expand and simplify 4 ( 2 𝑥 + 3 ) + 2 ( 4 𝑥 + 4 ) . 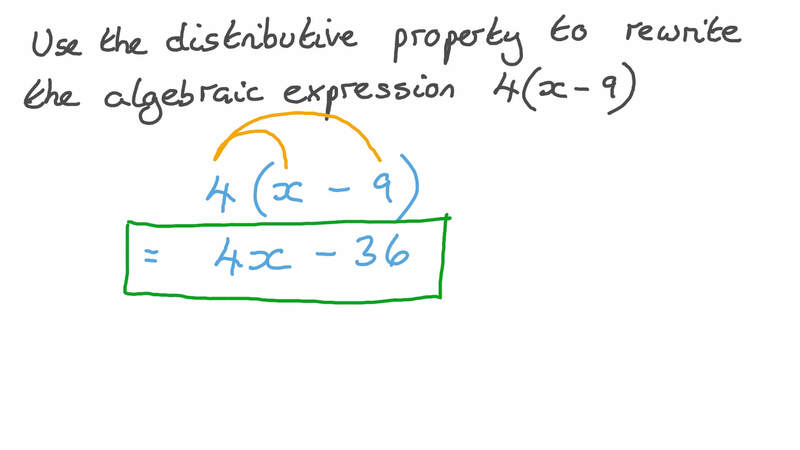 Use the distributive property to rewrite the algebraic expression 4 ( 𝑥 − 9 ) . Which of the following demonstrates the distributive property? Identify the expression which is not equivalent to the other three. Maged had b dollars in his savings account and then he deposited $11. seven months later, his balance had doubled. Which of the following is equivalent to his new balance of dollars? Write an expression in terms of 𝑥 , for the perimeter of the figure below. 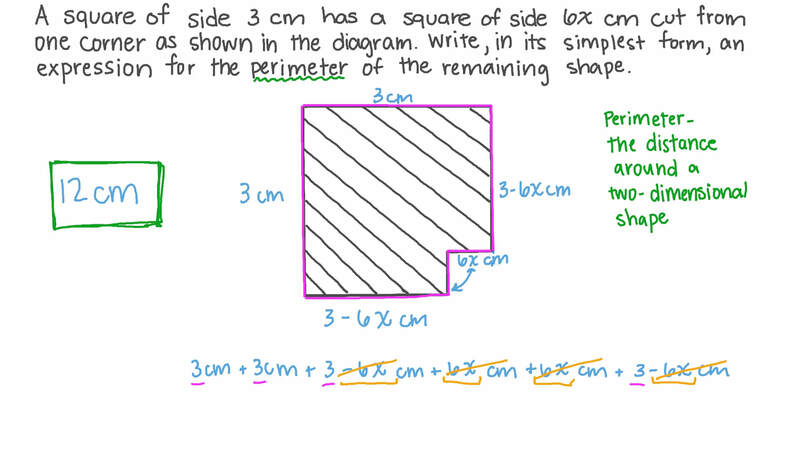 Find the perimeter of the following shape. A square of side 3 cm has a square of side 6 𝑥 cm cut from one corner as shown in the diagram. Write, in its simplest form, an expression for the perimeter of the remaining shape. Factor 3 0 𝑎 𝑏 + 4 5 𝑎 𝑏 2 2 completely. A student solving the equation 4 ( 𝑥 − 3 ) = 2 4 writes down 4 𝑥 − 1 2 = 2 4 as their first line of working. What algebraic property did they use? Determine the value of 𝑥 that makes the equation 4 ( 7 + 5 ) = 2 8 + 𝑥 true. Use the properties of real numbers to rewrite 6 ( 𝑥 + 3 ) as an equivalent expression that does not contain brackets. Which of the following expressions is equivalent to 7 ( 3 − 8 𝑥 ) ?